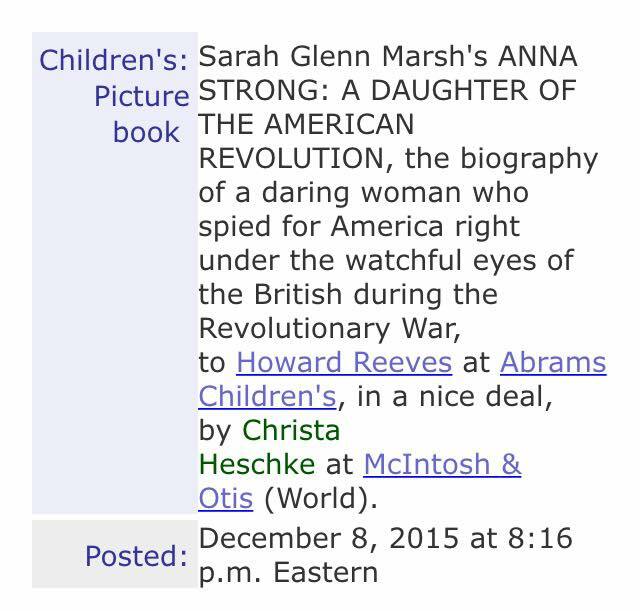 GOOD BOOK NEWS: Anna Strong Picture Book Sold to Abrams Kids! …Kind of. I actually found out in August, while on vacation in beautiful Savannah GA, that I’d be working with the amazing Howard Reeves at Abrams Kids on my nonfiction picture book biography of Anna Smith Strong. She was a spy during the Revolutionary War, helping to pass intelligence that aided General George Washington in winning the battle at Yorktown and turning the tide of the war. I learned Anna’s story while researching the Revolutionary War because of my interest in genealogy; I have several ancestors who fought in that war, one being Benjamin Pendleton, a soldier in the Culpeper VA militia, and another being Corbin Lane, who smuggled supplies to the rebels–Americans, that is. 🙂 When I read about Anna’s contributions to this incredible moment in history, I knew her story needed to be shared with kids everywhere; after all, girls and boys alike can appreciate the bravery of this female spy! I feel beyond lucky to be working with a place like Abrams Kids, and I can’t wait to bring Anna’s story to you all! Oh, and maybe watch this space for some more good news soon, okay?